If you already have an iPhone or iPod touch and don’t want to invest in the Amazon Kindle 2, now you don’t have to. Thanks to the Free Kindle for iPhone app from Amazon which gives you wireless access to the same 240,000-plus e-books previously only available on Amazon’s own Kindle and Kindle 2 electronic readers. New released books cost around $9.99 and there are lots of free previews that you can try out. Your purchases are wirelessly transferred to the iPhone or Touch. Other iPhone apps for reading books have been around for some time including Stanza and Classics, but now with the Kindle app, you get a ton of new content. Once you open the Kindle app, log in to your Amazon account to get going. You will see a list of your previously purchased eBooks which you can sort by date, title and author. Unfortunately the Kindle iPhone app does not allow you to buy books from your iPhone or iPod touch using the Kindle app at this time. 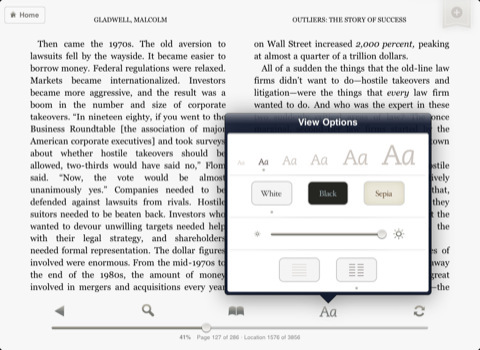 Sync to furthest Page Read – This is a breakthrough feature for eBooks. Since you can be reading the same book on a Kindle or an iPhone or an iPod touch, this button synchronizes your place to where you left off the last time you opened this book. On the bottom is a slider that you can use to quickly flip through the pages (location) on the book and it gives a visual representation of of how far along you are. The Kindle app does let you change the size of the text and both let you leave bookmarks. Both let you use Amazon’s Whispersync technology. This means if you have both a Kindle 2 and the iPhone app, you can start reading a book on a Kindle and then continue where you left off on your iPhone or Touch, and vice versa. When you are browsing the Kindle Store, you will see a button labeled “Send Sample Now” on many books. Just tap that button and choose your iPhone device from the drop down list. Amazon will wirelessly send a sample to your Kindle app the next time you hit the refresh button. Amazon calls this sync technology Amazon Whispernet technology. Samples let you check out lots of books that you would not have otherwise bought letting you experiment with new book authors and subjects. If you want to just try out the Kindle app, there are many free books available in the Kindle Store. Just grab a few of them and try out the Kindle for iPhone functionality for your self. What are the differences between the Kindle and the Kindle for iPhone app? Kindle also gives you the ability to subscribe to newspapers, magazines or blogs, but the iPhone app does not have this ability. On the iPhone you swipe the screen to change pages. On Kindle you press physical buttons. Amazon’s Kindle device has a much larger screen than the iPhone or iPod Touch. Kindle claims its battery lasts days or weeks while the iPhone goes into hours. Turning off WiFi in both devices helps increase battery lives. The Kindle iPhone app will not read-aloud books that the Kindle 2 does. The Kindle iPhone app does not have a dictionary. The Kindle for iPhone app doesn’t support inserting annotations on the iPhone, but you can read notes and highlights you entered on a Kindle. The iPad app features Amazon’s Whispersync tech to sync your eBook purchases automagically, even details such as the last page read, notes you’ve taken and bookmarks and highlighted text are sychronized across all your devices, including the Mac Kindle app, PC Kindle App, iPhone Kindle App, iPad Kindle app and more handhelds as well. The iPad Kindle app lets you browse the Amazon Kindle bookstore and buy from a selection of over 450,000 Kindle eBooks. You can sample books by reading some free chapters and buy if you like them. The app has virtual 3D page flipping graphical enhancements that resemble book like features. Books can be sorted by date, price and more, and viewed in either a grid view, or list view. The Kindle iPad app also competes for eBook dollars against the iPad’s very own built in app, “iBooks” which includes content in Apple’s Book Store. AppSafari review of Kindle for iPhone and iPad was written by Joe Seifi on March 4th, 2009 and categorized under App Store, Books, Featured, Productivity, Reading, Shopping. Page viewed 8899 times, 1 so far today. Need help on using these apps? Please read the Help Page. too bad the app is not available in Spore!! Thats great material, like your stuff, just passing to say hi! This post is just the tip of the iceberg.I think you made some good points in Features but there might be more good points.